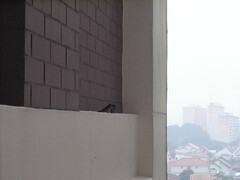 It’s not every day that you see a little local wildlife on the tenth floor of a HDB block. It was the middle of the afternoon on Sunday when I saw these two pretty little birds contemplating the woefully haze-filled sky from their shady perch. For once, I wished I knew enough about local birds to figure out what these were. The only other birds that I usually see in my neighbourhood are the evil-looking crows that haunt the walkway to the MRT station and the odd white heron that prowls the longkang (big drain) for prey after the thunderstorm water levels have fallen. I can also recognise mynahs and sparrows, but that’s about as far as my birdwatching skills go. Anyway, even though my picture-taking didn’t bother them, these little birds soared off after a couple of minutes. Places to be, insects to eat and cleaner air to breathe, no doubt.